In 1969 I came to Idaho from Montana and it March. The day we left Montana, there was still several feet of snow and ice, so when we reached Moscow, Idaho 7 hours later, I remember it was a beautiful sunny day complete with blue sky and white puffy clouds, and even though I was a young girl, I fell in love with the gentle rolling hills that had a glimmer of green. I didn't know what the green fields were, but I knew I had arrived in a place that I would forever call home. Karla went on to ask if would I share what was my favorite and not-so-favorite things about Idaho, from its landscape to its people. So sitting in my cozy chair by my fireplace in the deep chill of winter, I will attempt to paint with words what I live each day and every day. Because for me, it is where my rainbow ends and where all the riches I seek in life are family, friends, faith and life-style. Photo taken one evening in 2012 on "the Palouse"
Up North where I live also called "the Palouse", the farms rely on Nature to provide the timely rains for crops and the kinds of crops raised are the cereal grains (wheat, barley, oats) and legumes (garbanzos, lentils or peas). In the Southern part of the State, mainly potatoes and sugar beets are raised and those are irrigated crops. Idaho has seen an increase in dairies too. Around here, we don't really have a rush hour, more like having to sit occasionally through a stop light during a busy time is more like it. I like to think we have a slower pace of life and a better work/life balance and for the most part, I find my fellow Idahoans friendly, helpful and kind. But as in the past two blogs that I have written about, life in a rural area is not perfect in any manner. We have the same kinds of concerns/problems that others throughout the USA have, but on a much smaller scale. Today as I write this, it is January 19th and it was a spectacular day with a bright blue sky, white snowy fields that sport the occasional tracks of wildlife and the cold temperature has left the snow with a rough texture that sparkles in the sun. A sunny day in winter is a gift as most days are gray and sometimes it is hard to distinguish where the sky ends and the land begins. The air has a crisp smell though, but not much in the way of a scent, just clean and cold. In the country, winter is quiet. Springtime is sort of elusive and regardless of what the calendar says, I know Spring has officially arrived when I catch the first heavenly scent of the earth. Usually it is mid March - late April, and as the days grow longer, the feel of the sun is stronger- it is when the farmers start getting the ground ready for planting. When I breath in the smell of freshly tilled dirt- there is no other smell like it on earth and one that I have always loved. Summertime will find the non-farmers camping, fishing or playing in the many rivers or lakes. Many Idahoans are out-doors enthusiasts who like their toys (campers, 4 wheelers, bicycles, motorcycles and boats). Farmer's however, don't get to play as much because this is our busy time, but we will squeeze in a fun week-end if we can. Humidity is not an issue here and we can always count on nice warm weather right about the 4th of July, but it seems like mid-August the nights will cool down and I always keep a sweater handy. 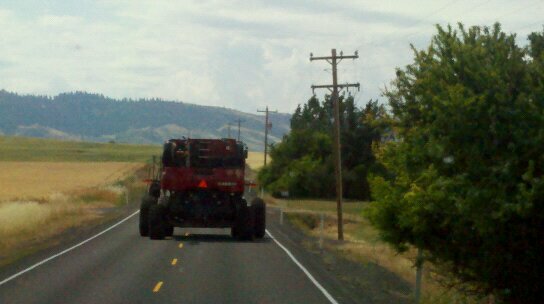 Mid-summer to early Fall on the Palouse is marked by harvest and pre-harvest has a smell to the air . I guess it is when Mother Nature says to the farmer, your crops are done and ready to be harvested! I do not like Indian casinos that are sprinkled throughout Idaho. I feel any kind of gambling industry is unhealthy and that does more harm to our state than good. I again, extend my invitation to tell me what you want to see on the blog and I'll do my best to make it happen, so drop me an email or leave a comment. All my best, Gayle. idahofarmwife@gmail.com. Your pictures are amazing - I love the one of seeding seeding spring wheat - it looks like the tractor is driving into the sky! I love your post on my home state. I was born and raised in the Boise Valley on a small dairy farm and Idaho will always be home. What a wonderful state! And God bless you as you carve out your new life. I love the Palouse! Lovely pics! I love Idaho, I have family in Buhl.